Our friendly family trout fishing trips offer the ultimate family outing. Bring your young family members to the great Smoky Mountain outdoors for a memorable trout fishing experience. These fishing trips are great for children ages 9 and up with NO previous trout fishing skills needed. 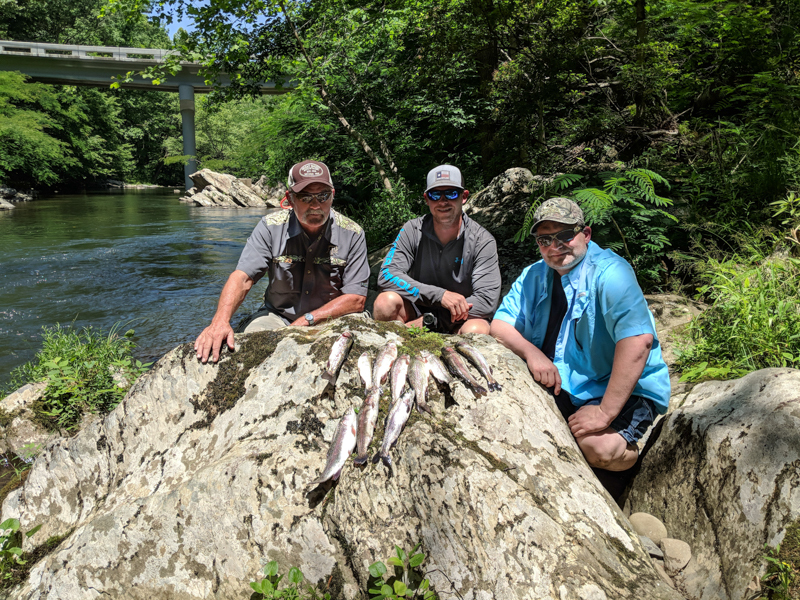 Using light spinning tackle, we teach all our anglers the basics needed to fish for trout on the beautiful mountain streams of the Great Smoky Mountains East Tennessee region. Everyone in the family can enjoy catching Trout or Smallmouth from our renowned rivers and streams throughout the Smokies. Basic casting skills are all that is needed to catch local mountain trout. Our guides will show you the baits to use, how to rig them, and what to look for when determining which areas of the streams are more likely for catching trout. From beginners to advanced anglers, our guides have the knowledge and experience to make your trip a fishing success. While we do wading fishing trips mostly in the summer months, most of our family trout fishing trips are done walking along the stream banks. Family members must be capable of walking short distances over mild to moderate terrain to access fishing sites. Shoes without slick soles are required for navigating stream banks and preventing falls. You are more than welcome to bring your favorite fishing tackle if you wish. We fish the various streams and rivers of Gatlinburg, Pigeon Forge and Sevierville as well as other waterways throughout East Tennessee. Most family fishing areas are within a 30 – 45 minute drive from these destinations. Smoky Mountains National Park, Clinch River, Holston River, Pigeon River, Nolichuky River are limited (up to 3 persons per guide), while (up to 4 persons per guide) are permitted on the other waterways. Trout in our clear water mountain streams are easily spooked and this slows down fish biting. It’s best to keep noise at a low level and please ensure family members don’t throw items into the water or splash around in the streams. Do not wear brightly colored clothing. Wearing more natural colors such as greens, blues and browns will help keep the trout from being aware of you and your family’s presence allowing everyone to get more bites. Most Mid-May thru Mid September trout fishing trips only require shorts and non-slick tennis or wading shoes, to prevent sliding on rocks. All Anglers (fishers) must sign a waiver. If water levels, weather conditions or other safety factors make the waters you are scheduled to fish un-fish-able the day of your trip, you may choose from other fish-able waters or reschedule the fishing trip for an available later date. Cancellation refunds are given only with 30 days prior notice before the date of the scheduled fishing trip or if the guide cancels the fishing trip due to weather and other unforeseen circumstances. Your card will not be charged a deposit when making your reservation, however it serves to hold your reservation and your $75.00 deposit. At the time of your fishing trip you may pay by cash or credit card, checks cannot be accepted. Your deposit of $75.00 will be charged for cancellation 30 days (or less) prior to your reserved fishing date or should you fail to show for your scheduled fishing trip. Cancellations by the fishing guide for unsafe weather and/or hazardous conditions at the time of your scheduled fishing trip will not result in a loss of your deposit. We furnish all the bottled water, rods, reels, bait and tackle as needed at no extra charge. You’re more than welcome to bring your own fishing gear should you desire. All that you need to supply is a fishing license, rain suit (just in case), and any preferred snacks and drinks (other than water). Anglers must purchase their Tennessee Fishing License and/or necessary permits if required. Other items you may wish to bring on your fishing trip are insect repellent, cap, sunglasses, snacks, drinks, camera, and rain gear (just in case). Fishing licenses and permits are the customer’s responsibility and may be purchased Locally or in advance thru The state’s Link at Tennessee Fishing License.